A marinade is a liquid mixture that a food, typically meat, soaks in prior to cooking. A rub, also called a dry rub, is a mixture of spices, herbs and seasonings that is rubbed onto a food, typically meat, prior to cooking. This area includes low-carb and sugar-free marinade recipes and rub recipes. All recipe provide nutritional information to make your diabetic meal planning easier. There are many types of commercial mojo sauces available in America, but you can't beat creating your own. 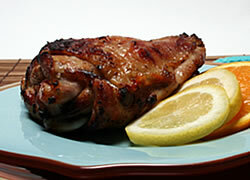 Recipe for Mojo Marinated Grilled Turkey from our Main Dishes recipe section.